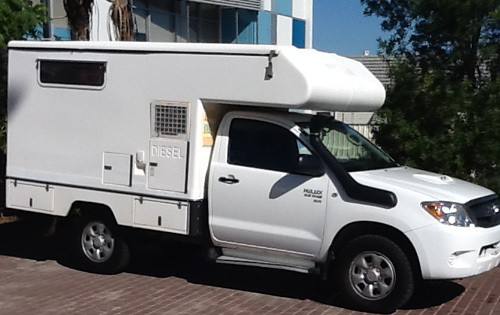 Looking for a tough, yet comfy 4×4 to take you around Australia? This is it! 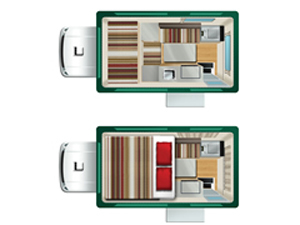 With a spacious rear cabin and outdoor awning, the 4×4 Adventurer is a fantastic way to experience the great outdoors. The large retractable side awning provides shelter for cooking, eat and relaxing. 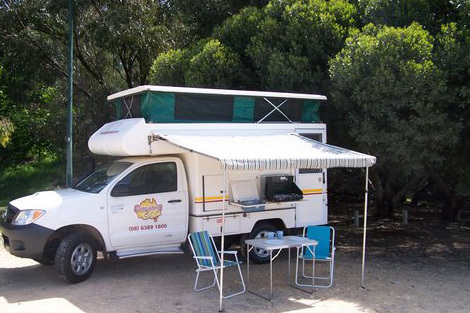 Out in the bush, you’ll be well equipped with stand-alone camping gear… and when you pass through town, you can even plug into caravan park power and enjoy home comforts of air conditioning or heating. There is plenty of ventilation inside, with side flyscreens along the roomy pop top roof. Fuel Capacity: 77 litre. Extra capacity of 40 litre tank. 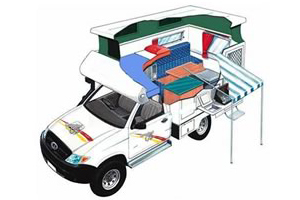 Air-conditioning or heating in driver’s cabin and in main living area. External sink. Cold water only. External 2 burner gas stove/grill. Gas Bottle: 2 x 1.25kg bottles are supplied full on vehicle collection. Tinted windows & flyscreens on some windows.